@stargazer I need to make time for more rugby. After commenting about how few of the Tongan names I recognised I reckon I know only one of the Eyeties (Ghiraldini). As for the Georgians not sure I'll recognise much more than Gorgodze (assume he'll make it?). Suspect there will be a whole lot of somethingsomethingashvilis though. @booboo Campagnaro is the captain and has been around a while, one of my fave players. Allan, Tebaldi, Zanni and Canna are other names I recognise as having been around a while too. Ghiraldini has the C in the graphic. Maaaybe Campagnaro is vaguely familiar to me. The others? Nup. No recollection. @booboo oh oops....he was captain last week. Georgian squad. I don't know many of the players - a lot of the familiar names are missing - but good to see that exciting young halfback, Gela Aprasidze, from their U20s team named on the bench. The Lelos will have to play the upcoming tests without several key players - Kote Mikautadze, David Kacharava, Karlen Asieshvili, Giorgi Nemsadze, Vito Kolelishvili, Koki Tkhilaishvili, Mirian Modebadze and Guga Shengelia along with most capped Georgian International Merab Kvirikashvili (114 caps) will miss TBC Rugby Series 2018 due to injuries. Haig also intended to invite Sandro Svanidze, one of the stand out and talented Georgian U20 graduate, but he also has an injury. “It’s a great opportunity for us to once again show the rugby world how Georgian Rugby has progressed, and in particular the decision makers within the Six Nations organization. We also clearly understand that we are the 'under dogs' going into the game, but it’s a position that we feel comfortable with. The best players in this Italian team are the flankers, Polledri and Negri. Their front five should be destroyed by the Georgian scrum which is far more powerful. Both sides have a poor backline. Georgians are missing both their starting locks, though. Fast game thus far. Two Georgian passes intercepted by Italy; with a quicker winger, Italy might have scored from the first one, but they didn't. Now, Georgia scores the first try. Now, a beautiful try scored by the Italian centre. Italy leads 10 - 7. Contest in the air for the high ball; Georgian player too late, and Italian player lands on this back. Yellow card for the Georgian, correct decision. But awful theatrics from the Italian player; unfortunately, he can't get red for that performance. Try by the Italian no. 8? The TMO says no. Glen Jackson explains why to the Italian captain, but it's impossible to hear what he's saying. It looked good to me, but maybe he was considered part of the ruck when he touched the ball. Excellent defence by the Georgians close to their try line for the last 5 minutes. The Italians can't get through it and decide to kick the penalty. Bit of a victory for the Georgians there. Finally, the try for Italy, scored by the left wing Bellini in the corner. That's the half time score. Entertaining first half. There's not much between these teams. 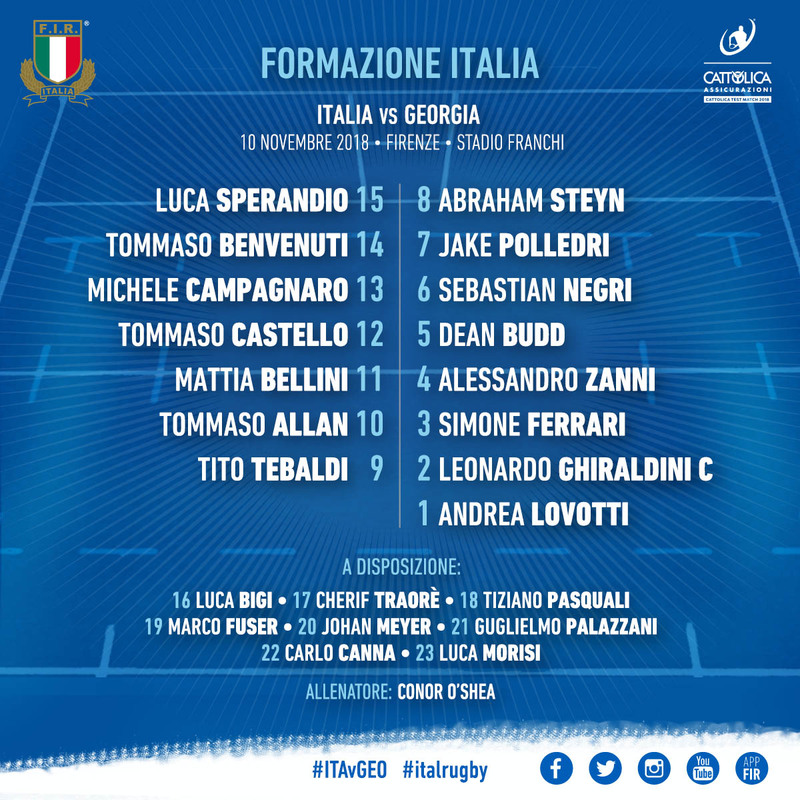 Thus far, Georgia hasn't yet shown they deserve Italy's spot in the Six Nations though. Now switching to the Eng-NZL test ..
Italy will win comfortably. There’s not that much between them but Italy are just a notch or two quicker.